North Korea’s First Lady drew plenty of public attention as she accompanied her husband Kim Jong-un during their unofficial visit to China. She notably engaged hordes of internet users into discussions of her looks and classy outfits, which could by no means have gone unnoticed. Ri Sol-ju, the enigmatic young wife of the North Korean chief and mother to their reportedly three children, appeared in public television broadcasts wearing at least three different outfits as the couple went on a two-day state visit to Beijing. The trip, which was conducted under a shroud of secrecy, was both Kim’s and Ri Sol-ju’s first diplomatic appearance abroad since Kim Jong-un took office after succeeding his father in 2011 and came shortly ahead of a scheduled summit with US President Donald Trump. In the welcoming ceremony, Ri wore a camel cropped jacket with a midi skirt and heeled narrow-toed shoes. 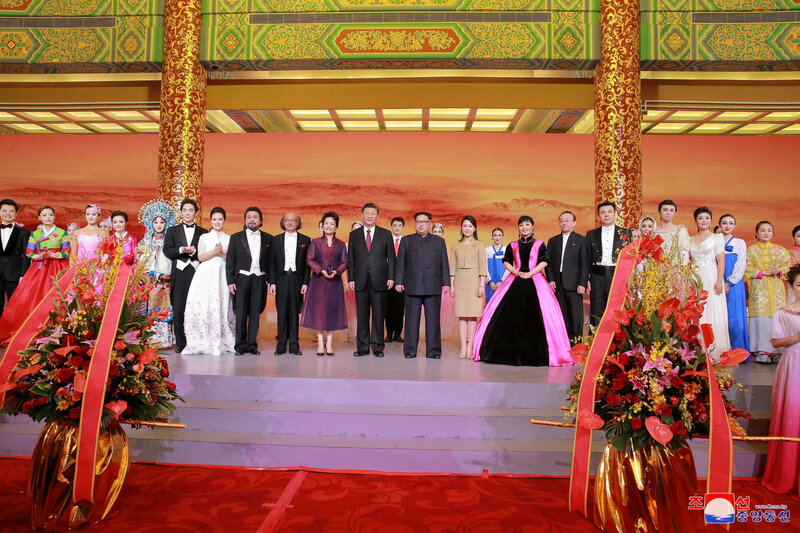 For a visit to the Chinese Academy of Sciences she changed into a white jacket and a green dress, which she wore with a brown flower-shaped ribbon brooch. Then she had lunch with Xi and Peng at the Diaoyutai State Guesthouse donning an ivory two-piece dress adorned with floral ornaments and soft frilled sleeves. 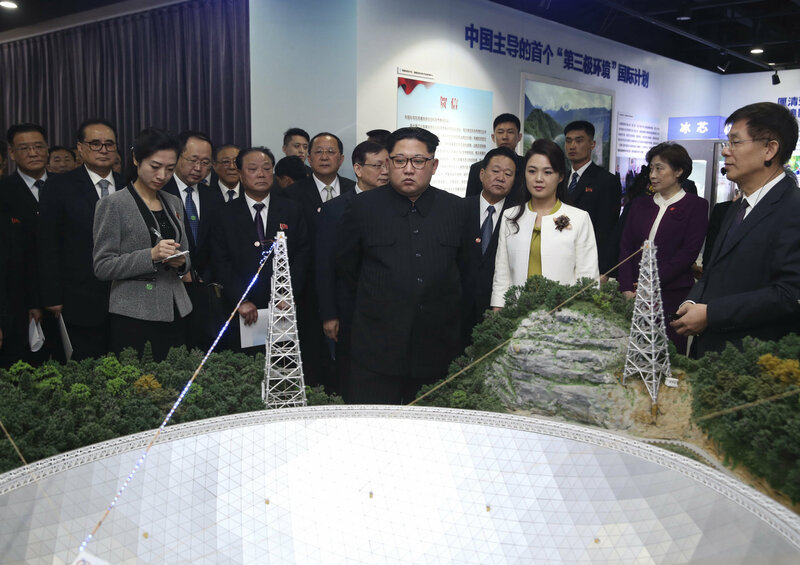 In this photo released Wednesday, March 28, 2018 by China's Xinhua News Agency, North Korean leader Kim Jong Un, center, and his wife Ri Sol Ju, visit an exhibition highlighting achievements by the Chinese Academy of Sciences. Many Chinese users immediately took to Weibo, China’s version of Twitter, to assess Ri Sol-ju’s looks, with many comparing her style to Peng Liyuan, China’s first lady. Nevertheless, censors took down all discussions on the subject from social media websites. Some praised her impeccable taste, saying it is rare for people coming from a country where fashion is not easily accessible. Others drew parallels with South Korean celebrities, namely actress Song Hye-kyo, who is also popular in China. Ri has been a mysterious figure on the North Korean arena for the past years. Kim officially announced their marriage in 2012, which was the first time in modern North Korean history that a first lady came into the spotlight. According to South Korean intelligence reports, the couple, who are presumably graduates of the same university, Kim Il-sung University, could have married earlier. Some sources have it that Ri is a former star singer in the Unhasu Orchestra, tremendously popular in Korea and abroad, but this has also not been confirmed. What’s more, North Korean officials allegedly removed all the footage of her performances, trying to shroud her past in mystery.